Best thing I’ve read. Right on about the adopting your culture cause they have none. I totally agree .Infact I would say it’s insulting for them to suddenly think they have the right to dress the same when they don’t even know what Muslim religion involves. That’s like operating on a patient in hospital with no medical training. I am Turkish by descent but raised in NZ so I don’t follow the Muslim way. I Infact follow the basic be good to all because I feel religion separates people to much. 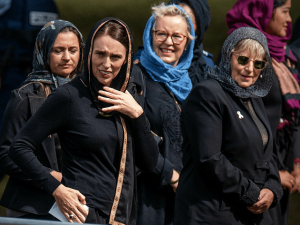 But the point that overnight the NZ PM thinks she has the right to dress and act as if she’s Muslim without knowing a thing or the values it holds to me is insulting. I have no idea if muslims feel the same but since they put so much time and dedication into their beliefs and she thinks she can just blend in well I think that’s insulting but that’s my opinion. Simply no culture no brain empty needing to fill a void that’s the western way. Any how loved your side of things. But he obviously doesn’t think New Zealand Muslims are “thinking Muslims”. Because they have shown great appreciation for the empathy shown them. Perhaps it is possible, at a distance, to take a loftier intellectual stance on these gestures? But his views are starkly at odds with those at ground zero. “Completely sacraficing”. Once again he has the luxury of distance. And a poor comprehension of New Zealand culture. These symbolic gestures of solidarity, far from “sacraficing” kiwi culture, they embody it. We like to see ourselves as a generous, hospitable people, at pains to make guests feel welcome, ready to ease anxieties and make people feel included. I think we owe some of this to the generous influence of Maori culture, it has certainly created a unique hybrid. And our local Muslims get it, they receive it in the spirit in which it is meant. Which is sincere. I would suggest that the writer visit us here, feel the welcome, talk to the affected people and get a taste of kiwi hospitality. Perhaps then he would see things as a “feeling” Muslim? Could not be stated any better or clearer….